Bricks by Ian pairs LEGO bricks and design to create one of a kind artistic pieces. Bricks by Ian also promotes team work by using LEGO bricks as a medium in activities that inspire communication and camaraderie. From models of your home to replicas of memorabilia, Bricks by Ian designs unique one of a kind items that are custom built to your standards. If you dream it, Ian will build it! Are you looking for an innovative team building opportunity to use to help engage your students or team members? Utilizing LEGO bricks allows for a new area of exploration focusing on enhancing skills in communication, teamwork, and creativity. Have you ever wanted a family portrait built out of LEGO bricks? Does your business need a talking piece that will stand out? We do it all from logos to printed images. Anything that you imagine can be built in 3-D. 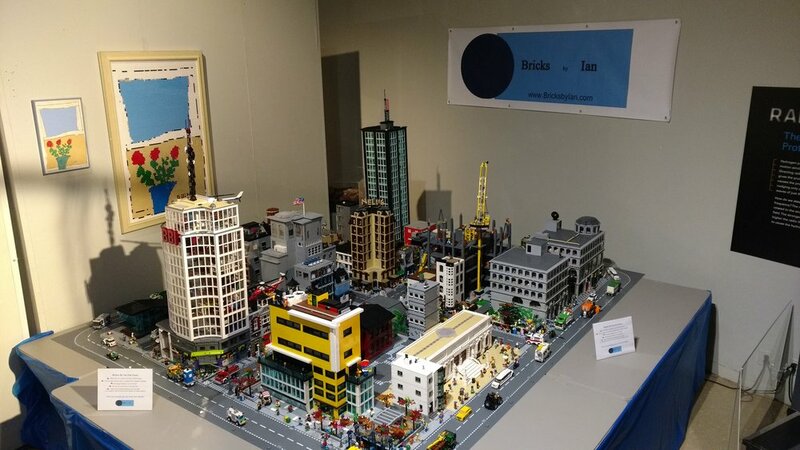 Whether it be a model of a building, a sign, a replica of your favorite pet, or anything else that you can think of, it can be built from LEGO bricks. Ian takes pride in ensuring every detail of a 3-D design is accurate. Ian believes that teamwork is the foundation for success. Having the ability to communicate and work as a team allows for trust, camaraderie, and growth to flourish. The team building possibilities are endless when using LEGO bricks as a material for your workshop. Ian has a strong background in facilitating programs that encourage team building and communication. Workshops are offered in a variety of areas and can be customized to meet the individual needs of the school, club, or business. Topic areas include, but are not limited to, communication, team building, and creative arts. Contact Bricks by Ian to discuss your custom needs. Teaching "Towers" at Plymouth Middle School. Looking for a unique medium to use to display a photo, company logo, or piece of art? LEGO bricks can be used to create a unique mosaic. Utilizing his design skills, Ian can turn your family portrait into a life-like LEGO piece or create a talking point using your business' logo. Mosaics are something that Ian takes great pride in, as they have become one of his favorite pieces to build. Provide Bricks by Ian with your design ideas to create into a beautiful mosaic masterpiece. Created for Megan's House, a residential treatment home for young women overcoming addiction. Commissioned for the lobby of one of the largest and most prestigious law firms in upstate New York.